We're headed to the Bay Area today to attend my cousin’s wedding. I can’t decide if I’m more excited about seeing all of my friends and family or about being able to sit uninterrupted for six hours to eat Road Trip Food and read my People magazine. Everyone I tell reacts the same, “Oh, you’re driving? Gross.” To which I pretend to roll my eyes in agreement and somehow blame Chris’ work schedule. But, really I am looking forward to the crazy long drive because it is the only way to get me away from the endless beckoning of my mother ship, the laptop. I’m thinking maybe something with pomegranates? 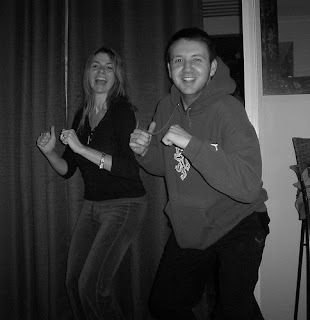 Obviously, my cousin is just using me for our mad dancing skills together. Here's to hoping we class it up for his wedding day. I make no promises. I shall steal away briefly this weekend to upload pictures. Because if I don’t share his wedding with the internet, did it really even happen?? Talk amongst yourselves. P.S. Locking-myself-out-of-a-burning-house story coming soon! i love road trips, and honestly prefer them to any other form of travel. I think there is simplicity in hopping in the car and going. much simpler, anyhow, than parking at the air port, checking in, going through security, sitting, boarding a plane, having a layover, repeating it again... waiting for luggage... blah blah blah. After all of that, you are likely halfway there, less tired and much happier! I dumped a pile of limes on a rattan placemat and called them centerpieces for my wedding. Add candles on the side and voila! you will get lots of compliments. I would love to take a road trip with my husband...have so much fun!! I can't tell you how much I'm loving your blog (by the way)! At my wedding I just floated some flowers in a bowl and threw down some candles. I think it might have been less than $20 a table. make a pit stop at Michael's. Have fun!! Road trip + husband = always fun. As long as you don't get lost. Then, not so much. Our centerpieces were little silver cups of bright-colored daisies. My wedding theme was "garish". It was fun. Have fun Lena! That picture of you is so pretty! Lena, if this advice is not too late- put taper or pillar candles inside those glass cover thingys for oil lamps. Put flowers and fruit in a ring around the bottom. Voila! Also, you could get tall vases and fill with fruit and sticks, and then some fresh flowers. It sounds bad, but if you do it right, it's actually very pretty. We drive down to Florida from Connecticut just about every year. Over 2 days. 3 kids. And it actually goes very well - we really like the driving thing. I like the dvd player in the van and the wireless connection - I can go online from the road. I'm sick that way. I like driving. That is, when it's to somewhere exciting. Not work. I hate driving to work. It's also more eco-friendly to drive the six hours than to ride a jet. I have no advice because I have no idea what to do with centerpieces and was going to ask someone else to take care of it. And you're scaring me. i vote pile of tulle on each table with a candle in the center, and hope it doesn't all catch on fire! and i bet it would actually look amazing! (and if you're sold on pomegranates, just add it to the tulle)! I call the couch! I'll bring my own Wheat Thins so as not to deplete your stash.